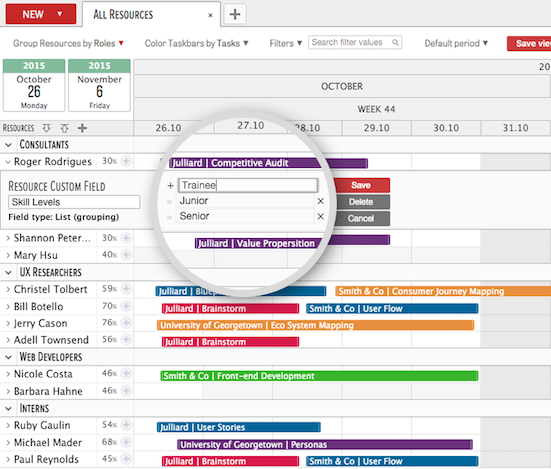 One of Ganttic’s most celebrated features is resource grouping. Resource grouping is just as its name suggests - grouping resources. 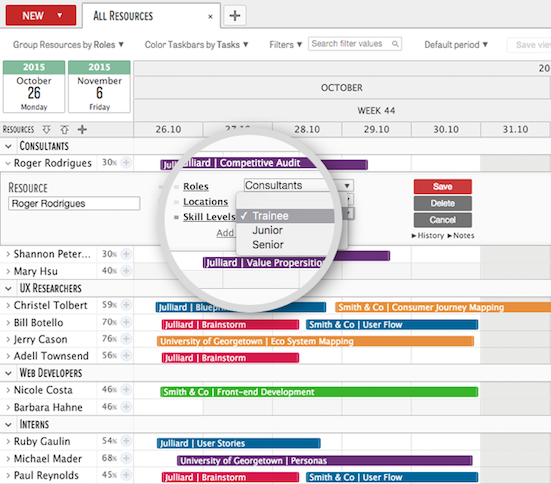 When you have a list of staff, equipments or vehicles to schedule, it can get quite complex when you need to scroll through all the names just to locate a particular resource. It wastes even more time when you are trying to locate a group of resources that is scattered across the list. Screenshot 1: Try keeping your eyes fixed on Roger, Bill and Adell’s tasks at the same time in the screenshot below. 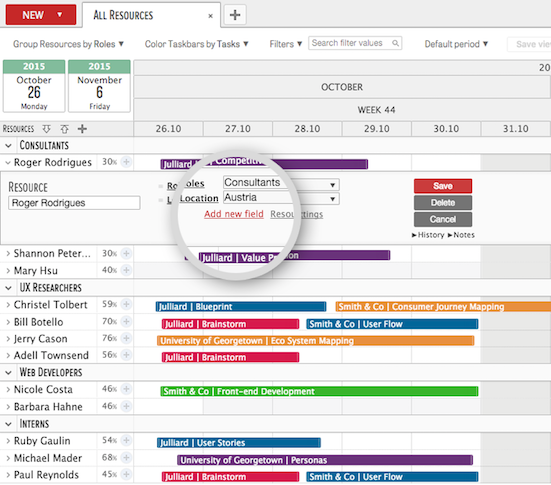 We wanted to eliminate this problem, so Ganttic gave the planner the ability to group your resources as you like it. If you haven’t set up any custom data fields in lists, your two options are either no resource grouping, or grouping resources by projects. Screenshot 2: Resources grouped by projects. 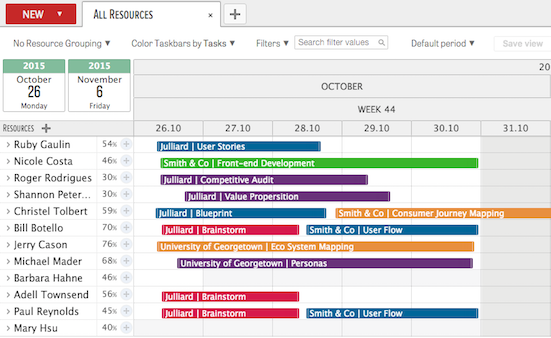 The grey faded tasks are tasks that don't belong under this particular project. For the ones who have had custom data fields set up in lists, the world is your oyster - you can group your resources by any type of lists that you define. Sorting your resources by roles? Or locations? Availability? Height? No problem! Screenshot 3: Resources grouped by roles. Screenshot 4: Resources grouped by locations. Sounds useful? It’s very easy to achieve this and group your resources by any type of data. First, click on a resource’s name. And in the task dialog (the huge grey box that spans across the planner), click on ‘Add new field’. Screenshot 5: Step 1 - click on a resource, Step 2 - click on ‘Add new field'. In the new task dialog that turns up, name your list. Then, select ‘List of values (grouping)’ from the dropdown and click ‘Save’. Screenshot 6: Step 3 - select ‘List of values (grouping)'. In the form field on the right, type your first value and hit your enter key to add the next value. Rinse, lather, repeat until you have included all of the values that you are including. Click ‘Save’. Screenshot 7: Step 4 - Start listing! 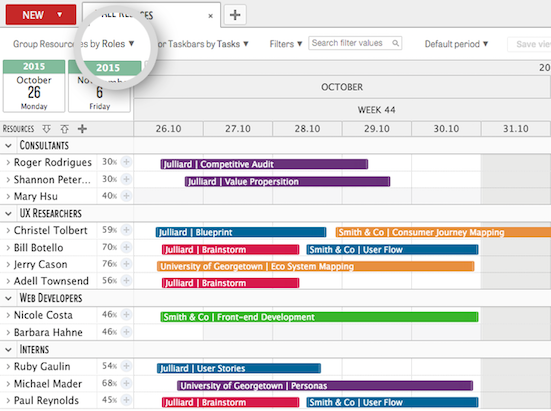 Once you click ‘Save’, head over to the dropdown beside your new list type and select a value for your resource. When done, click ‘Save’. Screenshot 8: Step 5 - Assign a value to the resource from your new list. When you are back in the planner, you might notice that nothing has changed. But fear not, your settings have been saved. 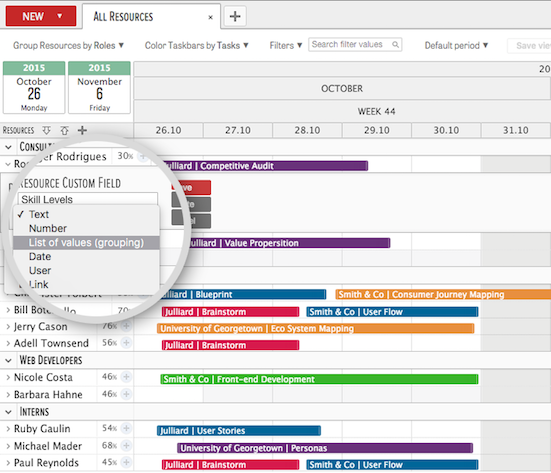 For best results, start with 'no resource grouping', and assign a custom data value to every resource. This is because if any resource do not have custom value(s) assigned to it, it will not show in the custom groupings. 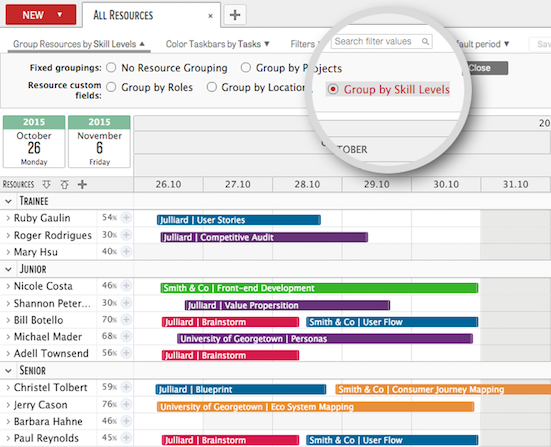 To change your grouping, simple navigate over and click on ‘Group Resources by…’. From the dropdown dialog, select the custom field that you had just added. In this case, it’s ‘Group by Skill Levels’. Click ‘Close’. Screenshot 9: Step 6 - Your resources are now grouped by your new custom data list. 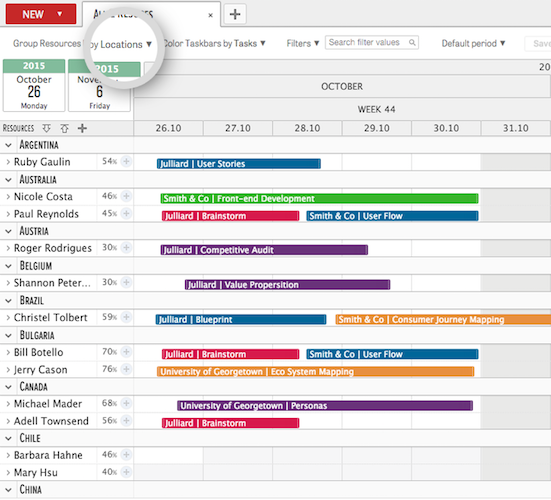 With this feature, you can choose to collapse any or every group for easier viewing. As you can clearly see, all your resources are grouped in a way that you want them to be grouped. 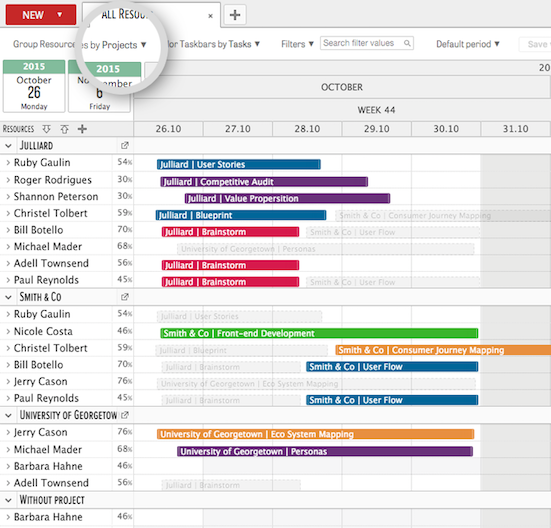 Resource grouping works great with Views, which you can save and open it up anytime. In the example above, Views will allow you to have multiple tabs with different saved configurations so that you don’t have to reset everything, every time you log in. Views will be elaborated more in the next feature best practices post. In the meantime, log in Ganttic to give resource grouping a try. If you don’t have an account, sign up for a 14-day free trial with unlimited everything to give resource grouping a try.